Jade Hameister, 16, is the youngest person to ever pull off the "Polar Hat Trick," or visiting the North and South Poles on skis. 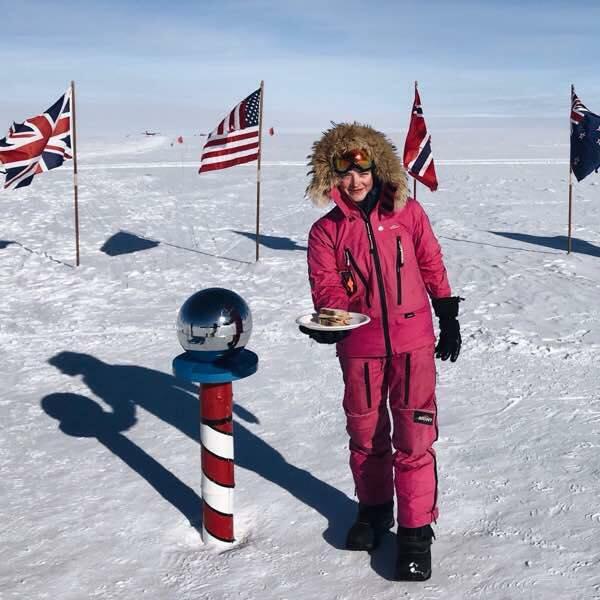 After skiing to the South Pole, the Australian teen had a message for the trolls who told her to "make me a sandwich": "I made you a sandwich (ham & cheese), now ski 37 days and 600km to the South Pole and you can eat it." Hameister posted on Facebook on Jan. 13 after skiing to the South Pole. She described the trip to the Amundsen-Scott South Pole Station "as close to what a Base on another planet would be like than anything else on the planet - a mini-town based around the scientific work of the National Science Foundation." But she also had a message for the people who commented "make me a sandwich" on her TEDx talk. "I made you a sandwich (ham & cheese), now ski 37 days and 600km to the South Pole and you can eat it," she wrote. At a TEDx talk in Melbourne, Australia, in 2016, Hameister spoke about her desire to be the youngest person to pull off the Polar Hat Trip. She already had become the youngest person to ski to the North Pole, which was also the longest journey to the Pole by any woman on the planet for the past two years. "As a young woman, I live in a world where I am constantly bombarded with messages to be less," she said in 2016. "To eat less, to wear less, to be skinnier, to shrink my ambitions to fit in, to wait for my Prince Charming to come and save me or to avoid activities that are for boys because I'm not as strong enough or as tough." But several people made misogynistic comments on the video, including "make me a sandwich." Hameister told CNN that the idea of taking a sandwich was a joke throughout the trip, but she didn't decide to do it until the last minute. According to CNN, Hameister was accompanied on the 37-day trip by National Geographic's two-person camera team, which will be releasing a documentary on the experience later this year. Her father also accompanied her on the trip.